Nothing like fate pounding at the keys. 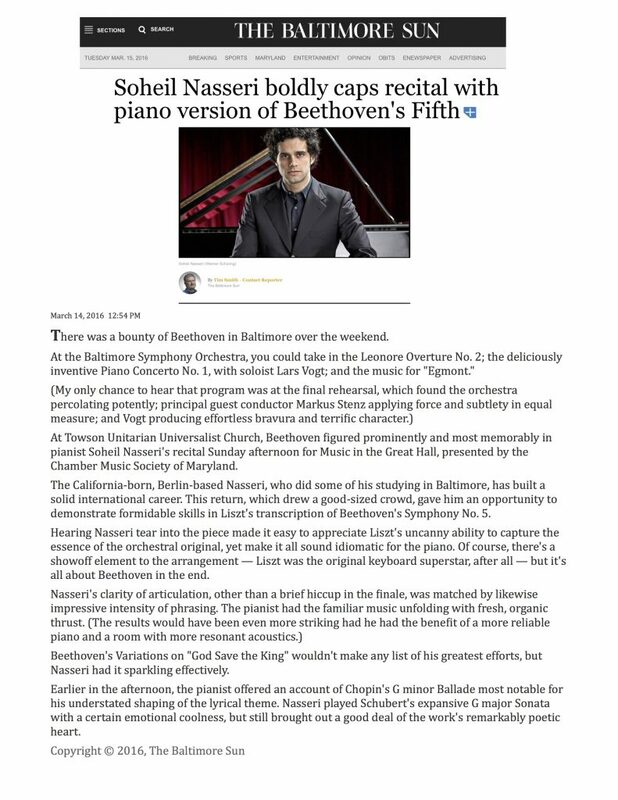 Soheil Nasseri excels in the Liszt arrangement of Beethoven’s Fifth. There was a bounty of Beethoven in Baltimore over the weekend. At Towson Unitarian Universalist Church, Beethoven figured prominently and most memorably in pianist Soheil Nasseri’s recital Sunday afternoon for Music in the Great Hall, presented by the Chamber Music Society of Maryland. The California-born, Berlin-based Nasseri, who did some of his studying in Baltimore, has built a solid international career. This return, which drew a good-sized crowd, gave him an opportunity to demonstrate formidable skills in Liszt’s transcription of Beethoven’s Symphony No. 5. Hearing Nasseri tear into the piece made it easy to appreciate Liszt’s uncanny ability to capture the essence of the orchestral original, yet make it all sound idiomatic for the piano. Of course, there’s a showoff element to the arrangement — Liszt was the original keyboard superstar, after all — but it’s all about Beethoven in the end. Beethoven’s Variations on “God Save the King” wouldn’t make any list of his greatest efforts, but Nasseri had it sparkling effectively. Earlier in the afternoon, the pianist offered an account of Chopin’s G minor Ballade most notable for his understated shaping of the lyrical theme. Nasseri played Schubert’s expansive G major Sonata with a certain emotional coolness, but still brought out a good deal of the work’s remarkably poetic heart.